The Spectrum Auction for PolicyTracker is designed to provide the security, reliability and the training capabilities. It can be used to prototype and test auction formats, test auction bid strategies and train auction bidders. PolicyTracker is the only newsletter devoted exclusively to spectrum management and policy. It organizes training events on all aspects of spectrum management, from specific issues to general courses covering the latest developments in the field. Quintagroup had previously worked with PolicyTracker on its business website, and due to the successful management of this initiative, was offered to undertake the development of online auction training system. PT Publishing operations requirements for this new project involved a very specific set of criteria. Overall, PT Publishing required a complete training platform that could be integrated into their website and would recreate the auction workflow for its subscribers. It was necessary to implement a Web based auction training system with the capability to cope with rapid bidding and changes in the price of the lots presented, while at the same time being maintainable and reusable. Quintagroup provided full-cycle services to deliver a secure training system that accepts auction bids and publishes auction results. Tight collaboration with the client has resulted in a foundation being built to support other types of auction training system in the future. With over 5 years of experience working with PT Publishing and a few previous successful projects, Quintagroup’s approach to finding the optimum solution involved conducting a range of usability sessions, whereby the results were incorporated into PT Publishing’s full list of functional requirements. From here it was concluded that the most appropriate all-encompassing solution came in the form of the powerfully minimalistic Plone CMS workflow engine as a base platform. An online auction is held in a real-time environment, specially configured for this very purpose. The auction employs a sealed bid combinatorial clock mechanism. Selected subscribers log into the system in order to take part in the bidding. Quintagroup exceeded PT Publishing expectations by creating a system that was unrivalled, meeting all of PT Publishing goals. 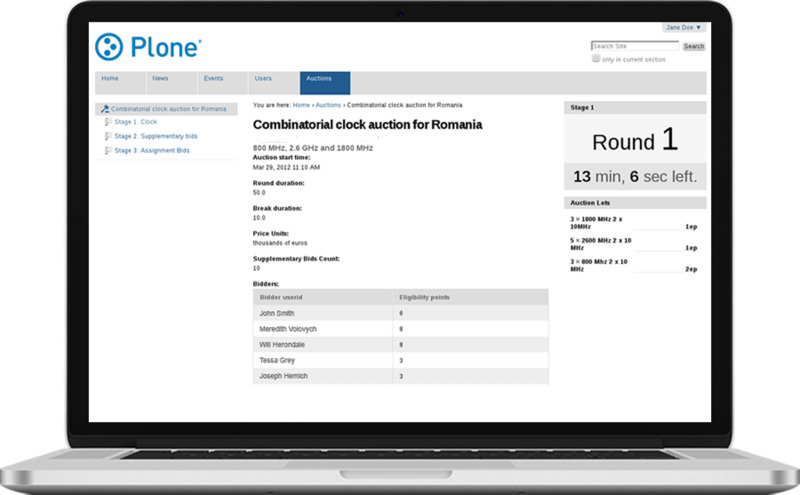 Using Plone workflow engine allows for the system to be quickly adapted to different auction strategies, formats and rules, including: simultaneous multiple-round auctions (SMRAs), ascending or descending clock auctions, sealed bid combinatorial auctions and multiple-round combinatorial auctions including the combinatorial clock auction (CCA). The auction training tool can be deployed over the Internet or private networks. It provides auction bidders with a rich dynamic interface for monitoring multiple-round auctions and making bids that can be accessed using a standard web-browser. It provides real-time updates for bidders and handles all aspects of rules implementation and auction management. Having Plone as a core provided the proper security needed for high-value auctions. The auction training application helps bidders manage the complexity of bidding in sealed combinatorial clock auctions and minimise the risk of mistakes that could disrupt an auction. The auction process is typically managed from an auctioneer interface that provides a number of administrative functions. The auctioneer can block the access to the system for the bidders, schedule rounds, etc. The system provides a full history of all decisions submitted during the auction. Ascending clock auctions with exit bids. Recently PolicyTracker online auction was successfully employed by the Nigerian regulator, the NCC, to sell 2.3 GHz spectrum license for 23 mln USD. Should you wish to discuss how Quintagroup could assist your company or organisation with e-commerce development, feel free to contact us anytime.